GLobal Forest Watch map showing protected areas and industrial concessions in and around the Leuser Ecosystem in Aceh and North Sumatra on the Indonesian island of Sumatra. The rate of forest loss in Indonesia’s Leuser Ecosystem — the only place on Earth where rhinos, orangutans, tigers, and elephants live in the same habitat — has more than doubled due to logging, encroachment, and conversion to industrial plantations, warn conservationists. 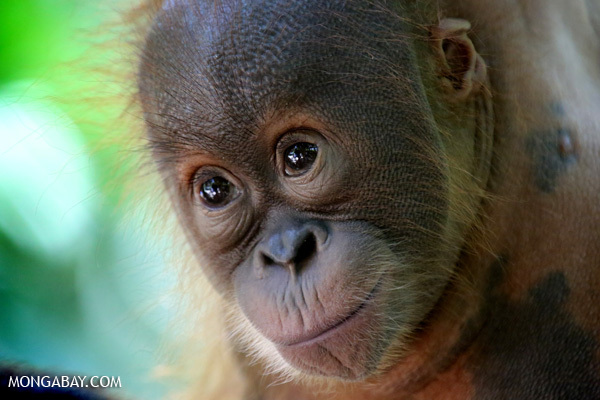 In a statement issued Tuesday, the Sumatran Orangutan Society reported that 80,316 hectares of forest were lost between 2008 and 2013, a sharp increase from the 30,830 hectares cleared between 2002 and 2008. The assessment is based on analysis of NASA satellite data published by researchers led by Matt Hansen of the University of Maryland. The data is available on Global Forest Watch, a forest monitoring tool. “These precious forests are vital to the survival of Sumatran orangutans, Sumatran tigers, Sumatran elephants and Sumatran rhinos – all are critically endangered. 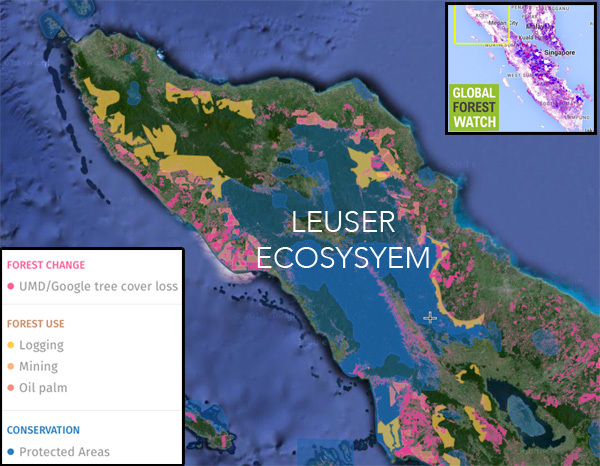 Large parts of the Leuser Ecosystem are protected under Indonesian law, but the forests are still falling,” said Helen Buckland, Director of the Sumatran Orangutan Society, in the statement. Young orangutan at a rehabilitation facility in North Sumatra. Photo by Rhett A. Butler. Worse, added Buckland, large blocks of Leuser may soon be turned over for logging, plantation development, and mining, putting wildlife and the benefits afforded by the ecosystem at risk. Aceh’s proposed revision to its spatial plan, which governs land use in the province, has been hotly contested for more than a year. 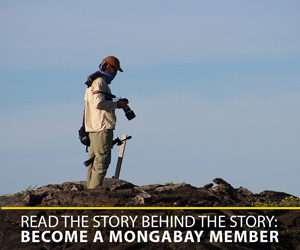 Companies have lobbied intensely for the government to open up previously off-limits forest areas to plantation, logging, and mining concessions. Environmentalists argue that open sensitive areas — especially steep slopes, watersheds, and carbon-dense peatlands — could heighten the risk of disasters Buckland mentioned. 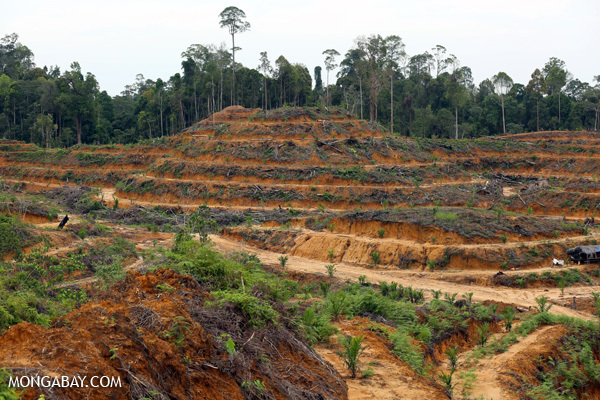 Deforestation for oil palm within the Leuser Ecosystem. This clearing is now being investigated. Photo by Rhett A. Butler. Sumatran Orangutan Society’s announcement coincides with the launch of its annual “Ape-ril” awareness-raising campaign, which encourages men to grow beards and women and children to don fake beards to highlight threats to endangered Sumatran orangutans, which are estimated to number less than 7,000 in the wild. The group has lined up several celebrities to advocate for the cause. “Having had the great privilege of seeing orangutans in the wild, I am steadfast in my belief that we must do all that we can to protect these magnificent creatures. You don’t need to climb a mountain or run a marathon to show your support – get involved with Ape-ril and do something that all male apes can do – grow a beard,” said British actor Brian Blessed in the statement. 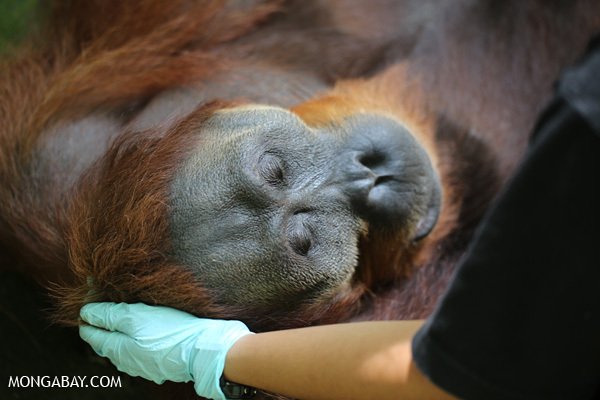 Male orangutan that has been tranquilized for a health check in North Sumatra. Photo by Rhett A. Butler. Sumatra lost nearly a quarter of its forests and more than 40 percent of its peatlands between 2000 and 2010, giving the highest deforestation rate of any major island during that period. Conversion for pulp and paper, timber, and palm oil production were the largest drivers of forest loss.